One of the largest crowds ever gathered in the Church of the Holy Family Ardara, on Friday September 1st for the month’s mind of John Gavigan of Dublin and formerly of Crucknagapple. John was a member of the Gardai until his retirement and was loved by all who knew him. Many a person could say thanks to John for helping them out in their hour of need. John came from one of the most respected families in our parish and this was bore out by the massive crowd that attended the month mind. We extend the sympathy of the community to his family and friends. The deadline for entries for this year’s Duchas is October 27th, and that date is approaching quickly. This year some excellent articles have been presented for publication so if you have a good article please email it to; layoutduchas@gmail.com or send to Duchas Office, West End, Ardara. This Saturday night 16th September, the Nesbitt Arms Hotel presents their annual harvest function with the very popular Patrick Feeney. This is always a very well attended dance as we say goodbye to the summer, doors open at 10.30 pm. One of the great events of the year takes place thanks to Pat Mc Gill, when the Johnny Doherty Festival kicks off on Friday September 22nd with award winning fiddle players Aidan O’Donnell and Ciaran O’Maoinaigh and guest Kevin O’Donnell opening the festival in the Beehive Bar at 8 pm. There will be dance classes all day Saturday in the Heritage Centre, starting at 11am with Ceili and Set Dancing, followed by Two Hand Dancing at 2 pm. The world famous Altan will perform in the Nesbitt Arms Hotel at 8pm on Saturday evening, and it is advisable to book now for this event. 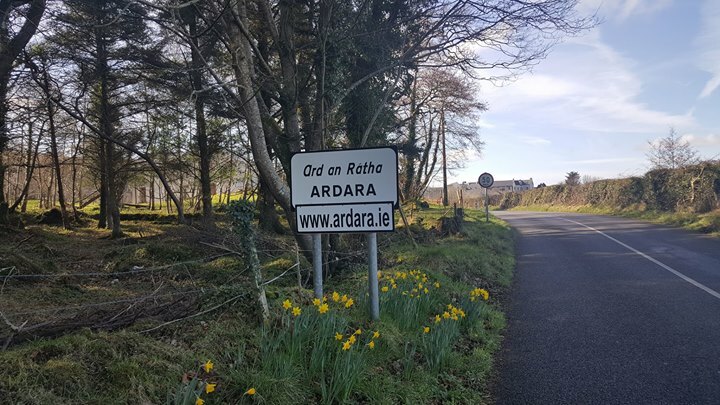 Ardara GAP Heritage and Heritage Group are having their second Warp and Weft of Heritage Weekend from Friday 13th to Sunday 15th October. We will start off with an Oíche Cois Tíne storytelling on Friday evening and all are welcome, it may even be a spooky evening! There are some lively talks on Saturday and Sunday mornings which include shipwrecks, tracing the lives of our local saints, seeking out Queen Medb’s royal site at Rathcroghan in Co. Roscommon, the truth and tales of the Spanish Armada, looking at our living landscape from the place names of Loughros Peninsula, how The Heritage Council works with communities and more. Saturday afternoon’s demonstration’s of traditional crafts takes place in the Heritage Centre and includes spinning, weaving, creel and basket making, hand-knitting and more. On Sunday afternoon there will be a field trip of the greater Ardara area. We hope that you will come and enjoy this weekend and help support our voluntary group. This is your heritage and hopefully you will agree that all the aspects of our heritage needs to be nourished and minded. Full event details can be found in the brochure, which is available locally. Online booking for registration is now open and you can contact: ardaraheritagehistory@gmail.com or 087-9214206 for full details.